2003-08-22 Assigned to ISP INVESTMENTS INC. reassignment ISP INVESTMENTS INC. ASSIGNMENT OF ASSIGNORS INTEREST (SEE DOCUMENT FOR DETAILS). Assignors: BOTSCHKA, ELLEN S., FOLTIS, LINDA C., GOMEZ, BLANCA, OROFINO, STEVE, JACHOWICZ, JANUSZ, KAROLAK, JEAN, MCMULLEN, ROGER L. JR.
What is described herein are compositions for treating hair and skin containing a cationic polymer derived from an N-vinyl lactam, preferably vinyl pyrrolidone (VP), a dimethylaminoalkylmethacrylamide, preferably dimethylaminopropyl methacrylamide (DMAPMA) and a quaternized C9 to C24 alkyl dimethylaminoalkyl(meth)acrylamide, preferably quaternized dimethylaminopropyl(meth)acrylamide (QDMAPMA) in a cosmetically acceptable concentration range. Hair, skin and other personal care compositions which include these and similar polymers described herein exhibit low tackiness, superior fixative properties and high humidity resistance as well as excellent penetrating and conditioning properties for oxidizing or reducing compositions as required in hair coloring, bleaching and permanent waving while further promoting hair texture and shine. This invention relates to compositions for use in hair and skin care featuring a specific cationic polymer, and, more particularly, to conditioning and styling compositions advantageously having improved conditioning, low tackiness and high humidity resistance. Compositions containing copolymers derived from vinylpyrrolidone (VP) and dimethylaminopropyl methacrylamide (DMAPMA) have been used extensively as active components of hair and skin compositions. While these copolymers are generally suitable polymers for such products as conditioners and shampoos, it is desired to provide superior polymers having improved performance characteristics in these and other personal care products. Commonly-owned U.S. Pat. No. 6,207,778 discloses conditioning/styling terpolymers of VP, DMAPMA and C9-C24 alkyl dimethylaminopropyl methacrylic acid quaternized monomers (QDMAPMA) and hair and skin care compositions which include these terpolymers and exhibit low tackiness and high humidity resistance. It is generally recognized that hair and skin formulations contain a mixture of components, including one or more of those selected from the group consisting of conditioning agents, protecting agents, such as, for example, hydrosoluble, liposoluble and water-insoluble UV filters, antiradical agents, antioxidants, vitamins and pro-vitamins, fixing agents, oxidizing agents, reducing agents, dyes, cleansing agents, anionic, cationic, nonionic and amphoteric surfactants, thickeners, perfumes, pearlizing agents, stabilizers, pH adjusters, filters, preservatives, hydroxy acids, cationic and nonionic polyether associative polyurethanes, polymers other than the cationic polymer described herein, vegetable oils, mineral oils, synthetic oils, polyols such as glycols and glycerol, silicones, aliphatic alcohols, colorants, bleaching agents, highlighting agents and sequestrants. These components usually comprise 0.001 to 20 wt. % of the total formulation. The disclosures of international publications WO 02/058661, pages 7-24; WO 02/058660, pages 7-8, WO 02/058649 at pages 6-13; WO 02/058648 at pages 6-26 and WO 02/058646 provide examples of such known and conventionally employed hair and skin formulation additives, typical use concentrations and suppliers thereof or identification of references where they are described. The disclosures of WO 02/058661, WO 02/058660, WO 02/058649, WO 02/058648 and WO 02/058646 are hereby incorporated by reference in their entirety. In accordance with this invention there is provided various personal care compositions and formulations which include conventional concentrations of known hair and skin altering components and a cosmetically acceptable amount of a cationic polymer derived from monomers of a vinyl lactam, an aminoalkyl acrylamide and/or an aminoalkyl acrylate, and a quaternized aminoalkyl acrylamide and/or a quaternized aminoalkyl acrylate and mixtures thereof. For the purposes of this disclosure, the term “acrylic” is intended to include unsubstituted acrylic and methacrylic radicals. Similarly “acrylamide” and “acrylate” are intended to include methacrylamide and methacrylate. Z is an anion of an organic or mineral acid. II is a quaternized derivative of an acrylic acid in which Z is an organic or mineral acid anion, e.g., a methosulfate, halide, tosylate or phosphate anion and where the weight % concentration of 11 in the terpolymer is between about 0.25 to 50, preferably 0.50 to 40 and most preferably 1-30%. Most preferred is the terpolymer derived from N-vinyl pyrrolidone, dimethylaminopropyl methacrylamide and a quaternized salt of dimethylaminopropyl methacrylamide, i.e. (VP/DMAPMA/QDMAPMA). where Ts is the tosylate anion of dodecyl tosylate. A more complete disclosure of applicants' preferred cationic polymer and its preparation is described in commonly owned U.S. Pat. No. 6,207,778 and in U.S. Pat. No. 5,626,836, the disclosures of which are hereby incorporated herein by reference in their entirety. In a preferred embodiment of the present invention, X is N-vinyl pyrrolidone, I is dimethylaminopropyl methacrylamide and 11 is a C1-2 alkyl quaternized derivative of the corresponding acrylic acid. Preferred monomer unit weight % concentrations in a homogeneous terpolymer are 60-90% X; 5-30% 1 and 1-30% 11. The cationic polymer preferably has a weight average molecular weight of 200,000 to 2,000,000, more preferably 300,000 to 1,000,000 and most preferably 400,000 to 800,000 as measured by conventional GPC techniques. The cationic polymer is a water soluble or water dispersible polymer which forms a clear humidity resistant, continuous, hydrophobic film when cast upon a support surface. Further, the cationic polymer is surface active and hydrolytically stable. In the cosmetic compositions of the present invention, a wide variety of enhanced skin and hair altering effects are achieved by the addition of between about 0.01 and about 10%, preferably 0.1 to 10 wt % based on the total weight of the composition of the cationic polymer to a standard or equivalent hair or skin formulation. 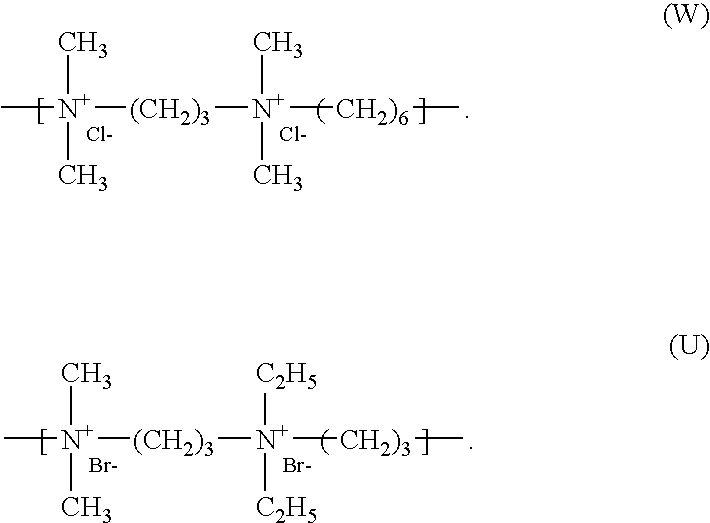 As illustrated above, monomer mixtures of X, 1 and 11 including mixtures of amino esters and amino amides and/or intermixtures of quaternized and non-quaternized amino ester and amino amides of 1 and 11 can be employed in the cosmetic formulations of this invention. Thus, the cationic polymer can comprise the described lactam, with an amino ester non-quaternized component and a quaternized amino amide derivative of acrylic acid monomer or with an amino amide non-quaternized component and a quaternized amino ester component in the terpolymer of X, 1 and 11. R9 and R10 each denote a hydrogen atom or a C1-C5 alkyl radical, provided that at least one of R9 and R10 is H. In a particularly preferred embodiment the vinyllactam is vinylpyrrolidone. In preferred embodiments, R3, R4, R5 are independently H or a C1-C30 linear or branched alkyl radical. In a most preferred embodiment, R5 contains at least 8 carbon atoms. The cationic polymer can contain one or more additional monomers, which can be cationic or nonionic, such as, for example, acrylamide, hydroxyethylethyl methacrylate, vinyl imidazole, quaternized vinyl imidazole and the like. 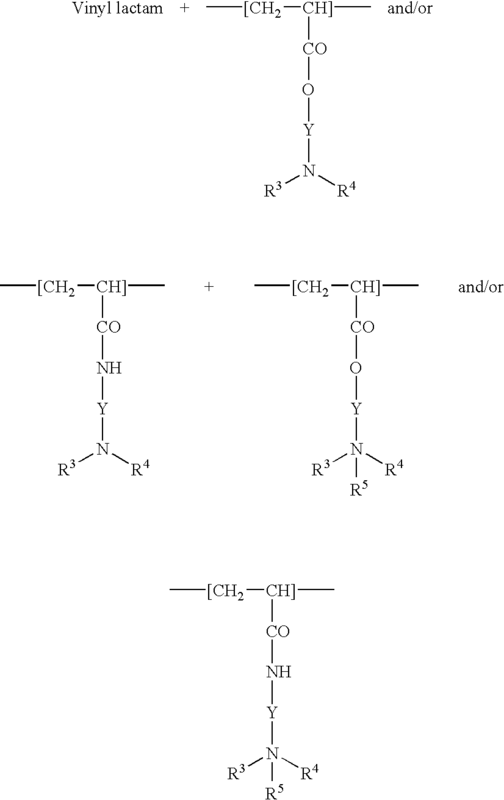 In preferred embodiments, the cationic polymer contains, by weight, (a) 40 to 95% monomer IV, (b) 0.25 to 50% monomer (II), and (c) 0.1 to 55% monomer (I). Further in preferred embodiments, the cationic polymer is a terpolymer chosen from vinylpyrrolidone/dimethylaminopropylmethacrylamide/dodecyldimethylmethacrylamidopropyl-ammonium tosylate terpolymers; vinylpyrrolidone/dimethylaminopropylmethacrylamide/cocoyldimethylmethacrylamidoamidopropylammonium tosylate terpolymers; vinylpyrrolidone/dimethylaminopropylmethacrylamide/lauryldimethylmethacrylamidopropylammonium tosylate or chloride terpolymers. Any known conditioning agent is useful in the hair compositions of this invention. Conditioning agents function to improve the cosmetic properties of the hair, particularly softness, thickening, untangling, feel, and static electricity and may be in liquid, semi-solid, or solid form such as oils, waxes, or gums. Similarly, any known skin altering agent is useful in the compositions of this invention. Preferred conditioning agents include cationic polymers, cationic surfactants and cationic silicones. Conditioning agents may be chosen from synthesis oils, mineral oils, vegetable oils, fluorinated or perfluorinated oils, natural or synthetic waxes, silicones, cationic polymers, proteins and hydrolyzed proteins, ceramide type compounds, cationic surfactants, fatty amines, fatty acids and their derivatives, as well as mixtures of these different compounds. The synthesis oils include polyolefins, e.g., poly-α-olefins such as polybutenes, polyisobutenes and polydecenes. The polyolefins can be hydrogenated. The mineral oils suitable for use in the compositions of the invention include hexadecane and oil of paraffin. Suitable animal and vegetable oils include sunflower, corn, soy, avocado, jojoba, squash, raisin seed, sesame seed, walnut oils, fish oils, glycerol tricaprocaprylate, Purcellin oil or liquid jojoba. Suitable natural or synthetic oils include eucalyptus, lavender, vetiver, litsea cubeba, lemon, sandalwood, rosemary, chamomile, savory, nutmeg, cinnamon, hyssop, caraway, orange, geranium, cade, and bergamot. Suitable natural and synthetic waxes include carnauba wax, candelila wax, alfa wax, paraffin wax, ozokerite wax, vegetable waxes such as olive wax, rice wax, hydrogenated jojoba wax, absolute flower waxes such as black currant flower wax, animal waxes such as bees wax, modified bees wax (cerabellina), marine waxes and polyolefin waxes such as polyethylene wax. The cationic polymers (other than the poly(alkyl)vinyllactam polymers according to the invention) that may be used as a conditioning agent according to the invention are those known to improve the cosmetic properties of hair treated by detergent compositions. The expression “cationic polymer” as used herein, indicates any polymer containing cationic groups and/or ionizable groups in cationic groups. The cationic polymers used generally have a molecular weight the average number of which falls between about 500 and 5,000,000 and preferably between 1000 and 3,000,000. The preferred cationic polymers are chosen from among those containing units including primary, secondary, tertiary, and/or quaternary amine groups that may either form part of the main polymer chain or a side chain. (1) homopolymers and copolymers derived from acrylic or methacrylic esters or amides. The copolymers can contain one or more units derived from acrylamides, methacrylamides, diacetone acrylamides, acrylamides and methacrylamides, acrylic or methacrylic acids or their esters, vinyllactams such as vinyl pyrrolidone or vinyl caprolactam, and vinyl esters. Specific examples include: copolymers of acrylamide and dimethyl amino ethyl methacrylate quaternized with dimethyl sulfate or with an alkyl halide; copolymers of acrylamide and methacryloyl oxyethyl trimethyl ammonium chloride; the copolymer of acrylamide and methacryloyl oxyethyl trimethyl ammonium methosulfate; copolymers of vinyl pyrrolidone/dialkylaminoalkyl acrylate or methacrylate, optionally quaternized, such as the products sold under the name GAFQUAT by International Specialty Products; the dimethyl amino ethyl methacrylate/vinyl caprolactam/vinyl pyrrolidone terpolymers, such as the product sold under the name GAFFIX VC 713 by International Specialty Products; the vinyl pyrrolidone/methacrylamidopropyl dimethylamine copolymer, marketed under the name STYLEZE CC 10 by International Specialty Products; and the vinyl pyrrolidone/quaternized dimethyl amino propyl methacrylamide copolymers such as the product sold under the name GAFQUAT HS 100 by International Specialty Products. (2) derivatives of cellulose ethers containing quaternary ammonium groups, such as hydroxy ethyl cellulose quaternary ammonium that has reacted with an epoxide substituted by a trimethyl ammonium group. (3) derivatives of cationic cellulose such as cellulose copolymers or derivatives of cellulose grafted with a hydrosoluble quaternary ammonium monomer, as described in U.S. Pat. No. 4,131,576, such as the hydroxy alkyl cellulose, and the hydroxymethyl-, hydroxyethyl- or hydroxypropyl-cellulose grafted with a salt of methacryloyl ethyl trimethyl ammonium, methacrylamidopropyl trimethyl ammonium, or dimethyl diallyl ammonium. (4) cationic polysaccharides such as described in U.S. Pat. Nos. 3,589,578 and 4,031,307, guar gums containing cationic trialkyl ammonium groups and guar gums modified by a salt, e.g., chloride of 2,3-epoxy propyl trimethyl ammonium. (5) polymers composed of piperazinyl units and alkylene or hydroxy alkylene divalent radicals with straight or branched chains, possibly interrupted by atoms of oxygen, sulfur, nitrogen, or by aromatic or heterocyclic cycles, as well as the products of the oxidation and/or quaternization of such polymers. (6) water-soluble polyamino amides prepared by polycondensation of an acid compound with a polyamine. These polyamino amides may be reticulated. (7) derivatives of polyamino amides resulting from the condensation of polyalcoylene polyamines with polycarboxylic acids followed by alcoylation by bi-functional agents. (8) polymers obtained by reaction of a polyalkylene polyamine containing two primary amine groups and at least one secondary amine group with a dioxycarboxylic acid chosen from among diglycolic acid and saturated dicarboxylic aliphatic acids having 3 to 8 atoms of carbon. Such polymers are described in U.S. Pat. Nos. 3,227,615 and 2,961,347. (9) the cyclopolymers of alkyl dialyl amine or dialkyl diallyl ammonium such as the homopolymer of dimethyl diallyl ammonium chloride and copolymers of diallyl dimethyl ammonium chloride and acrylamide. (10) quaternary diammonium polymers such as hexadimethrine chloride. Polymers of this type are described particularly in U.S. Pat. Nos. 2,273,780, 2,375,853, 2,388,614, 2,454,547, 3,206,462, 2,261,002, 2,271,378, 3,874,870, 4,001,432, 3,929,990, 3,966,904, 4,005,193, 4,025,617, 4,025,627, 4,025,653, 4,026,945, and 4,027,020. (11) quaternary polyammonium polymers, including, for example, Mirapol®A 15, Mirapol®AD1, Mirapol®AZ1, and Mirapole 175 products sold by Miranol. (12) the quaternary polymers of vinyl pyrrolidone and vinyl imidazole such as the products sold under the names Luviquat® FC 905, FC 550, and FC 370 by BASF. (14) reticulated polymers known in the art. Other cationic polymers that may be used within the context of the invention are cationic proteins or hydrolyzed cationic proteins, polyalkyleneimines such as polyethyleneimines, polymers containing vinyl pyridine or vinyl pyridinium units, condensates of polyamines and epichlorhydrins, quaternary polyurethanes, and derivatives of chitin. Preferred cationic polymers are derivatives of quaternary cellulose ethers, the homopolymers and copolymers of dimethyl diallyl ammonium chloride, quaternary polymers of vinyl pyrrolidone and vinyl imidazole, and mixtures thereof. The conditioning agent can be any silicone known by those skilled in the art to be useful as a conditioning agent. The silicones suitable for use according to the invention include polyorganosiloxanes that are insoluble in the composition. The silicones may be present in the form of oils, waxes, resins, or gums. They may be volatile or non-volatile. The silicones can be selected from polyalkyl siloxanes, polyaryl siloxanes, polyalkyl aryl siloxanes, silicone gums and resins, and polyorgano siloxanes modified by organofunctional groups, and mixtures thereof. Suitable polyalkyl siloxanes include polydimethyl siloxanes with terminal trimethyl silyl groups or terminal dimethyl silanol groups (dimethiconol) and polyalkyl(C1-C20) siloxanes. Suitable polyalkyl aryl siloxanes include polydimethyl methyl phenyl siloxanes and polydimethyl diphenyl siloxanes, linear or branched. The silicone gums suitable for use herein include polydiorganosiloxanes preferably having a number-average molecular weight between 200,000 and 1,000,000, used alone or mixed with a solvent. Examples include polymethyl siloxane, polydimethyl siloxane/methyl vinyl siloxane gums, polydimethyl siloxane/diphenyl siloxane, polydimethyl siloxane/phenyl methyl siloxane and polydimethyl siloxane/diphenyl siloxane/methyl vinyl siloxane. Suitable silicone resins include silicones with a dimethyl/trimethyl siloxane structure and resins of the trimethyl siloxysilicate type. The organo-modified silicones suitable for use in the invention include silicones such as those previously defined and containing one or more organofunctional groups attached by means of a hydrocarbon radical and grafted siliconated polymers. Particularly preferred are amino functional silicones. The silicones may be used in the form of emulsions, nano-emulsions, or micro-emulsions. The conditioning agent can be a protein or hydrolyzed cationic or non-cationic protein. Examples of these compounds include hydrolyzed collagens having triethyl ammonium groups, hydrolyzed collagens having trimethyl ammonium and trimethyl stearyl ammonium chloride groups, hydrolyzed animal proteins having trimethyl benzyl ammonium groups (benzyltrimonium hydrolyzed animal protein), hydrolyzed proteins having groups of quaternary ammonium on the polypeptide chain, including at least one C1-C18 alkyl. Hydrolyzed proteins include Croquat L, in which the quaternary ammonium groups include a C1-2 alkyl group, Croquat M, in which the quaternary ammonium groups include C10-C18 alkyl groups, Croquat S in which the quaternary ammonium groups include a C1-8 alkyl group and Crotein Q in which the quaternary ammonium groups include at least one C1-C18 alkyl group. These products are sold by Croda. The conditioning agent can comprise quaternized vegetable proteins such as wheat, corn, or soy proteins such as cocodimonium hydrolyzed wheat protein, laurdimonium hydrolyzed wheat protein and steardimonium hydrolyzed wheat protein. According to the invention, the conditioning agent can be a ceramide type of compound such as a ceramide, a glycoceramide, a pseudoceramide, or a neoceramide. These compounds can be natural or synthetic. Compounds of the ceramide type are, for example, described in Patents pending DE4424530, DE4424533, DE4402929, DE4420736, WO95/23807, WO94/07844, EP-A-0646572, WO95/16665, FR-2 673 179, EP-A-0227994, WO 94/07844, WO 94/24097, and WO 94/10131. Ceramide type compounds useful herein include 2-N-linoleoyl amino-octadecane-1,3-diol, 2-N-oleoyl amino-octadecane-1,3-diol, 2-N-palmitoyl amino-octadecane-1,3-diol, 2-N-stearoyl amino-octadecane-1,3-diol, 2-N-behenoyl amino-octadecane-1,3-diol, 2-N-[2-hydroxy-palmitoyl]-amino-octadecane-1,3-diol, 2-N-stearoyl amino-octadecane-1,3,4-triol, N-stearoyl phytosphingosine, 2-N-palmitoyl amino-hexadecane-1,3-diol, bis-(N-hydroxy ethyl N-cetyl) malonamide, N(2-hydroxy ethyl)-N-(3-cetoxyl-2-hydroxy propyl)amide of cetylic acid, N-docosanoyl N-methyl-D-glucamine and mixtures of such compounds. The conditioning agent can be a cationic surfactant such as a salt of a primary, secondary, or tertiary fatty amine, optionally polyoxyalkylenated, a quaternary ammonium salt, a derivative of imadazoline, or an amine oxide. Suitable examples include mono-, di-, or tri-alkyl quaternary ammonium compounds with a counterion such as a chloride, methosulfate, tosylate, etc. including, but not limited to, cetrimonium chloride, dicetyidimonium chloride, behentrimonium methosulfate, and the like. The presence of a quaternary ammonium compound in conjunction with the polymer described above reduces static and enhances combing of hair in the dry state. The polymer also enhances the deposition of the quaternary ammonium compound onto the hair substrate thus enhancing the conditioning effect of hair. The conditioning agent can be any fatty amine known to be useful as a conditioning agent; e.g. dodecyl, cetyl or stearyl amines, such as stearamidopropyl dimethylamine. The conditioning agent can be a fatty acid or derivatives thereof known to be useful as conditioning agents. Suitable fatty acids include myristic acid, palmitic acid, stearic acid, behenic acid, oleic acid, linoleic acid, and isostearic acid. The derivatives of fatty acids include carboxylic ester acids including mono-, di-, tri- and tetra-carboxylic acids. The conditioning agent can be a fluorinated or perfluorinated oil. Fluorinated oils include perfluoropolyethers described in EP-A-486135 and the fluorohydrocarbon compounds described in WO 93/11103. The fluoridated oils may also be fluorocarbons such as fluoramines, e.g., perfluorotributylamine, fluoridated hydrocarbons, such as perfluorodecahydronaphthalene, fluoroesters, and fluoroethers. Of course, mixtures of two or more conditioning agents can be used. The conditioning agent or agents can be present in an amount of 0.001% to 20%, preferably from 0.01% to 10%, and even more preferably from 0.1% to 3% by weight based on the total weight of the final composition. The composition of the invention can contain one or more protecting agents to prevent or limit the degrading effects of natural physical and/or chemical assaults on the keratinous materials. The protecting agent can be chosen from hydrosoluble, liposoluble and water-insoluble UV filters, antiradical agents, antioxidants, vitamins and pro-vitamins. The above-described cationic polymer enhances the deposition of these materials onto the hair or skin substrate enhancing protection of hair to UV damage. Organic UV filters (systems that filter out UV rays) can be chosen from among hydrosoluble or liposoluble filters, whether siliconated or nonsiliconated, and mineral oxide particles, the surface of which may be treated. Hydrosoluble organic UV filters may be chosen from para-amino benzoic acid and its salts, anthranilic acid and its salts, salicylic acid and its salts, hydroxy cinnamic acid and its salts, sulfonic derivatives of benzothiazoles, benzimidizoles, benzoxazoles and their salts, sulfonic derivatives of benzophenone and their salts, sulfonic derivatives of benzylidene camphor and their salts, derivatives of benzylidene camphor substituted by a quaternary amine and their salts, derivatives of phthalydenecamphosulfonic acids and their salts, sulfonic derivatives of benzotriazole, and mixtures thereof. Hydrophilic polymers which have light-protective qualities against UV rays can be used. These include polymers containing benzylidene camphor and/or benzotriazole groups. Suitable liposoluble organic UV filters include derivatives of para-aminobenzoic acid, such as the esters or amides of para-aminobenzoic acid; derivatives of salicylic acid; derivatives of benzophenone; derivatives of dibenzoyl methane; derivatives of diphenyl acrylates; derivatives of benzofurans; UV filter polymers containing one or more silico-organic residues; esters of cinnamic acid; derivatives of camphor; derivatives of trianilino-s-triazine; the ethylic ester urocanic acid; benzotriazoles; derivatives of hydroxy phenyl triazine; bis-resorcinol-dialkyl amino triazine; and mixtures thereof. The liposoluble (or lipophilic) organic UV filter according to the invention can be chosen from octyl salicylate; 4-tert-butyl-4′-methoxy dibenzoyl methane; octocrylene; 4-methoxy cinnamate; 2-ethylhexyl [2-ethylhexyl 4-methoxycinnamate]; and 2-(2H-benzotriazol-2-yl)-4-methyl-6-[2-methyl-3-[1,3,3,3-tetramethyl-1-[(trimethyl silyl)oxy] disiloxanyl]propynyl]phenol. Other UV filters particularly preferred for use herein are derivatives of benzophenones such as 2-hydroxy-4-methoxy benzophenone-5-sulfonic acid, 2-hydroxy-4-methoxy benzophenone, derivatives of benzalmalonates such as poly dimethyl/methyl(3(4-(2,2-bis-ethoxy carbonyl vinyl)-phenoxy)-propenyl) siloxane, derivatives of benzylidene camphor such as b-b′camphosulfonic [1-4 divinylbenzene] acid and derivatives of benzimidazole such as 2-phenylbenzimidazol-5-sulfonic acid. Water-insoluble UV filters include various mineral oxides. The mineral oxides may be selected from among titanium oxides, zinc oxides, and cerium oxides. The mineral oxides can be used in the form of ultrafine nanoparticles. Preferred UV filters include Escalol HP-610 (dimethylpabamido propyl laurdimonium tosylate and propylene glycol stearate) and Crodasorb HP (polyquaternium 59). The protecting agent can be present in an amount 0.001% to 20% by weight, preferably from 0.01% to 10% by weight, and more preferably 0.1 to 5% by weight of the total weight of the final composition. The composition of the invention can contain a fixing agent. in which n is a whole number from 0 to 10, A1 denotes a methylene group, optionally bonded to the carbon atom of the unsaturated group or to a neighboring methylene group when n is greater than 1 by means of a heteroatom like oxygen or sulfur, R7 denotes a hydrogen atom, a phenyl or benzyl group, R8 denotes a hydrogen atom, a lower alkyl or carboxyl group, R9 denotes a hydrogen atom, a lower alkyl group, a —CH2—COOH, phenyl or benzyl group and polymers containing units derived from sulfonic acid like vinylsulfonic, styrenesulfonic, acrylamidoalkylsulfonic units. c) at least one basic comonomer, such as esters with primary, secondary, tertiary, and quaternary amino substituents of acrylic and methacrylic acids and the product of quaternization of dimethylaminoethyl methacrylate with dimethyl or diethyl sulfate. The fixing agent can be a nonionic polymer chosen from polyalkyloxazolines; vinyl acetate homopolymers; vinyl acetate and acrylic ester copolymers; vinyl acetate and ethylene copolymers; vinyl acetate and maleic ester copolymers; polyethylene and maleic anhydride copolymers; homopolymers of alkyl acrylates; homopolymers of alkyl methacrylates; copolymers of acrylic esters; copolymers of alkyl acrylates and alkyl methacrylates; copolymers of acrylonitrile and a nonionic monomer chosen from among butadiene and alkyl(meth)acrylates; copolymers of alkyl acrylate and urethane; and polyamides. The fixing polymer can be a functionalized or unfunctionalized, silicone or non-silicone polyurethane. The fixing polymer can be a polymer of the grafted silicone type containing a polysiloxane portion and a portion consisting of a nonsilicone organic chain, with one of the two portions forming the main chain of the polymer, and with the other being grafted onto said main chain. The fixing agent can be present in the composition in a relative weight concentration between 0.1 and 10%, preferably 0.5 and 5%. The composition of the invention can contain an oxidizing agent. The oxidizing agent can be chosen from the group of hydrogen peroxide, urea peroxide, alkali metal bromates, ferricyanides, persalts, and redox enzymes, optionally with their respective donor or cofactor. In a particularly preferred embodiment, the oxidizing agent is hydrogen peroxide. The oxidizing agent can be a solution of oxygenated water whose titer varies from 1 to 40 volumes. The composition of the invention can contain at least one reducing agent in amounts from 0.01 to 30 wt %, preferably 0.05 to 20 wt % of the total weight of the composition. The reducing agents useful in the practice of this invention can be selected from thiols, like cysteine, thioglycolic acid, thiolactic acid, their salts and esters, cysteamine, and its salts or sulfites. In the case of compositions intended for bleaching, ascorbic acid, its salts and its esters, erythorbic acid, its salts and its esters, and sulfinates, like sodium hydroxymethanesulfinate can be used. The composition of the invention can contain a dye selected from the group consisting of neutral acid or cationic nitrobenzene dyes, neutral acid or cationic azo dyes, quinone dyes, neutral, acid or cationic anthraquinone dyes, azine dyes, triarylmethane dyes, indoamine dyes and natural dyes. The dye or dyes can be present in a concentration from 0.001 to 20% and preferably 0.005 to 10 wt % based on the total weight of the composition. Suitable amphoteric polymers include a copolymer containing at least one acrylic acid and a dimethyldiallyammonium salt as a monomer. The cationic or amphoteric polymer or polymers can be present in an amount of 0.01 to 10%, preferably 0.05 to 5%, and more preferably 0.1 to 3% by weight of the total weight of the composition. The composition of the invention can contain one or more additional cosmetically acceptable additives chosen from conditioning agents, protecting agents, such as, for example, hydrosoluble, liposoluble and water-insoluble UV filters, antiradical agents, antioxidants, vitamins and pro-vitamins, fixing agents, oxidizing agents, reducing agents, dyes, cleansing agents, anionic, cationic, nonionic and amphoteric surfactants, thickeners, perfumes, pearlizing agents, stabilizers, pH adjusters, filters, preservatives, hydroxy acids, cationic and nonionic polyether associative polyurethanes, polymers other than the cationic polymer described herein, vegetable oils, mineral oils, synthetic oils, polyols such as glycols and glycerol, silicones, aliphatic alcohols, colorants, bleaching agents, highlighting agents and sequestrants. These additives are present in the composition according to the invention in proportions that may range from 0 to 20% by weight in relation to the total weight of the composition. The precise amount of each additive may be easily determined by an expert in the field according to its nature and its function. The compositions according to the invention may be used to wash and treat keratinous material such as hair, skin, eyelashes, eyebrows, fingernails, lips, and hairy skin. The compositions according to the invention can be detergent compositions such as shampoos, bath gels, and bubble baths. In this mode, the compositions will comprise a generally aqueous washing base. The surfactant or surfactants that form the washing base may be chosen alone or in blends, from known anionic, amphoteric, or non-ionic surfactants. The quantity and quality of the washing base must be sufficient to impart a satisfactory foaming and/or detergent value to the final composition. The washing base can be from 4% to 50% by weight, preferably from 6% to 35% by weight, and even more preferentially from 8% to 25% by weight of the total weight of the final composition. The pH of the composition applied to the keratinous material is generally between 2 and 12. It is preferably between 3 and 8, and may be adjusted to the desired value by means of acidifying or alkalinizing agents that are well-known in the state of the art in compositions applied to keratinous materials. Thus, the composition of the invention can contain at least one alkalizing or acidifying agent in amounts from 0.01 to 30 wt % of the total weight of the composition. in which R is a propylene residue optionally substituted with an hydroxyl group or a C1-C4 alkyl radical; R38, R39, R40 and R41, identical or different, represent a hydrogen atom, a C1-C4 alkyl radical or C1-C4 hydroxyalkyl radical. The acidifying agent can be chosen from mineral or organic acids, like hydrochloric acid, orthophosphoric acid, carboxylic acids like tartaric acid, citric acid, or lactic acid, or sulfonic acids and the like. The physiological and cosmetically acceptable medium may consist exclusively of water, a cosmetically acceptable solvent, or a blend of water and a cosmetically acceptable solvent, such as a lower alcohol composed of C1 to C4, such as ethanol, isopropanol, t-butanol, n-butanol, alkylene glycols such as propylene glycol, and glycol ethers. However, the compositions of the invention can be anhydrous. Generally the present cosmetic compositions are prepared by simple mixing procedures well known in the art. The invention also has as its object a process for treating keratinous material including the skin or hair, characterized in that it consists of applying to skin or keratinous materials a cosmetic composition as described above, and then eventually rinsing it with water. Accordingly, the process according to the invention makes it possible to maintain the hairstyle, treatment, care, washing, or make-up removal of the skin, the hair, and any other keratinous material. The compositions according to the invention may also take the form of after-shampoo compositions, to be rinsed off or not, for permanents, straightening, waving, dyeing, or bleaching, or the form of rinse compositions to be applied before or after dyeing, bleaching, permanents, straightening, relaxing, waving or even between the two stages of a permanent or straightening process. The compositions of the invention may also take the form of skin-washing compositions, and particularly in the form of solutions or gels for the bath or shower, or of make-up removal products. The compositions of the invention may also be in the form of aqueous or hydro-alcoholic solutions for skin and/or hair care. The compositions of this invention have demonstrated thermal protection from heat styling tools, more specifically curling or straightening irons. In this application, the cationic polymer provides a continuous film on hair that does not degrade nor whiten upon regular exposure to curling irons at temperatures up to 152° C. Protection is observed via tryptophan measurements and perceived by consumer in combing force reduction. The compositions described herein are useful in products for personal care, including, but mot limited to, gels, lotions, glazes, glues, mousses, sprays, fixatives, shampoos, conditioners, 2n1 shampoos, temporary hair dyes, semi-permanent hair dyes, permanent hair dyes, straighteners, permanent waves, relaxers, creams, putties, waxes, pomades, moisturizers, mascaras, lip balms and foam enhancers. The following compositions are representative of hair and skin altering formulations. The ACP 1234 polymer in the following examples is VP/DMAPMA/QDMAPMA in 74/15/11 wt. % monomer concentration. A propene/butene propellant was employed to pressurize the above mixture in a metal container to provide a spray. After thorough mixing the above mixtures were poured into separate cans and pressurized with propellant. These mousse formulations were tested over a period of 3 months for stability and found to show no darkening or reduction in resistance to humidity. The hair treated with formulations of Example 4 styling mousse exhibited high shine, curl snap and curl memory. Parts A and B were separately prepared and then mixed in a high speed mixer for about 18 minutes, after which part C was added and homogenized for an additional 18 minutes and then cooled to about 45° C. Mixing of the resulting cooled homogenized mixture was continued at moderate speed for 10 minutes before adding and mixing in Part D and Liquapar Optima. The homogenized product had a pH of 5.06 and a Brookfield viscosity of 4.6×103 Cps using a RVT DV-11 Brookfield viscometer TB at 20 rpm. The mousse is applied to the hair for 15 minutes before rinsing off. The hair when dried has a soft shimmering texture. Styling produces a set with superior curl snap and curl memory. Part A appears well mixed and homogeneous. Continue slow stirring and allow solution to cool to an ambient temperature. Add Part C while stirring and eventually add Part D.
Heat Part A to 60° C. with moderately slow stirring for approximately ½ hr. or until solution becomes transparent. At the same time, heat Part B to 55° C. while stirring until homogeneous solution is obtained. Add Part B to Part A while continuously stirring. Remove temperature source. Once the resulting solution has reached 45° C., add Part C. Continue to stir (slowly) until the target solution has cooled to an ambient temperature. In the conditioners and shampoo formulations tested under actual use conditions in comparison with similar formulations with known polymers, the terpolymers of the invention have excellent wet combing, excellent dry feel and softness, and excellent wet feel. A styling lotion formulation was prepared in aqueous solution using 1% by weight of the terpolymer ACP 1234 and 0.1% preservative. This lotion had excellent hold and resistance to humidity. A concentrate is prepared by dissolving 1 g of the terpolymer of Example 1, 0.1 g of preservative and 98.9 g of deionized water. A styling mousse formation is prepared by mixing 70 g of the concentrate and 30 g of hydrocarbon propellant in an aerosol can provided with a mousse dispenser. This example is repeated using VP/DMAPMA/DMAPMA quaternized with hexadecyl bromide which provides excellent heat protecting properties to the hair. The above bleaching composition was applied and left for 45 minutes beneath a hood to natural hair, then rinsed abundantly with water. Brightening of the hair was obtained. A bleaching cream ready-for-use is obtained, which applied and left for 45 minutes under a hood, permitted strong and homogeneous bleaching of dark natural hair to be obtained. After 10 minutes of waiting, the lock is abundantly rinsed again. The hair is then unwound from the curler and dried. The lock is waved. The following hair fixative compositions are in accordance with this invention. ***Vinylpyrrolidone/dimethylaminopropyl-methacrylamide/lauryldimethylmethacrylamidoammonium chloride terpolymer (74/15/11) prepared according to U.S. Patent 6,207,778. **Vinylpyrrolidone/dimethylaminopropylmethacrylamide/lauryldimethylmethacrylamidoammonium chloride terpolymer (72/16/12) prepared according to U.S. Patent 6,207,778. The above bleaching composition permitted regular bleaching of artificially dyed hair with an oxidation dye. **Vinylpyrrolidone/dimethylaminopropylmethacrylamide/lauryldimethyl methacrylamidoammonium chloride terpolymer (74/15/11). The above permanent wave composition was applied for 15 minutes to wetted hair, wound beforehand onto rollers into curls, then rinsed abundantly with water. A solution of oxygenated water of 8 volumes and pH 3 was then applied for 5 minutes, then rinsed again and the rollers removed and the hair dried. The hair presented an excellent homogeneous hair style. The above bleaching composition was applied to natural gray hair with 90% white, dyed beforehand with shade 20 (copper) of the L'Oreal Movida scale with a bath ratio of 10 g per 1 g of hair. After 30 minutes of waiting, the locks were rinsed and dried. The copper reflection disappeared, revealing the hair as it was before application of the dye again. This reducing composition was applied to a lock of wet hair first wound onto curlers 9 mm in diameter. After 10 minutes of waiting, it was rinsed abundantly with water. An oxidizing composition was then applied (oxygenated water 8 volumes at pH 3). After 10 minutes of waiting, the lock was rinsed again abundantly. The hair was then unwound from the curler and dried. The lock was wavy. The dye composition was mixed at the moment of use in a plastic bowl and over 2 minutes with the oxidizing composition mentioned above in an amount of 1 part dye composition per 1.5 parts oxidizing composition. The obtained mixture is applied to locks of natural hair consisting of 90% white hair and allowed to stand for 30 minutes. The locks are rinsed with water, washed with standard shampoo and rinsed again with water, then dried and untangled. The hair was dyed to a strong brown shade. Carbomer is homogenized in a glass vessel with deionized water after which the remaining components of Part A are added in the order listed. The resulting liquid is neutralized with 99% triethanol amine of Part B and components of Part C are then added and mixed until a homogeneous lotion is obtained. This lotion when applied to the skin, exhibits moisturizing and anti-aging properties. *100 g. benzophenone-4 + 50 g. 6M NaOH + 49.5 g. distilled water were mixed until dissolution of the photoabsorber after which 100 g GAFQUAT 755N and 100 g ZnO were added and then milled to a paste. In the above formulation, prior to the addition of the color protectant, the tertiary polymer, water, surfactants, preservative and Panthenol were stirred until a uniform mixture was obtained. The resulting liquid was then mixed to form a liquid dispersion. The above formulation was prepared in a manner similar to Example 24. In the above formulation, Phases A and B were separately compounded before combining in a uniform dispersible mixture. The hair styling lotion of Example 27 was repeated except that, in Phase B, only 2.5 grams of terpolymer and 43 grams of water were employed. Both formulations provided easily dispersible liquids upon shaking and exhibited excellent holding power when applied to the hair. The styling mousse of Example 29 was repeated except that only 2.5 grams of the terpolymer and 93.45 grams of distilled water were employed. Both formulations were loaded into aerosol containers and both produced a hair fixative having excellent hold. The above ingredients were stirred until a uniform mixture was obtained and the loaded into an aerosol container. The formulation of Example 31 was repeated except that only 2.5 grams of the terpolymer and 91.75 grams of distilled water were employed. Both formulations exhibited excellent hold when applied to hair. The above formulation was mixed to uniform composition and an anionic hair dye developer was added, i.e. 3 wt % H2O2+1.5 wt. % acrylate/Steareth-20 methacrylate copolymer+0.1 wt. % Na EDTA+95.4 wt. % deionized water. Equal volumes of dye colorant gel and dye developer and mixed before application to the hair. When applied to the hair, the above formulation produced a rich brown color over a natural moussy brown. The coloring gel of Example 33 was repeated except that a non-ionic dye developer was employed, i.e. 3 wt. % H2O2+1.5 wt. % PEG-150/stearyl/SMDI copolymer+0.1 wt. % Na EDTA+0.1 wt. % phosphoric acid. This formulation also produced a rich brown color. Phase B is prepared by slowly adding hydroxyethylcellulose and ACP 1234 to propylene glycol in water. Phase A is prepared separately by mixing ingredients. Then Phase A is added to Phase B and mixed until a uniform, clear gel is formed. Part I: heat oil phase ingredients to 60° C. and water to the same temperature. Dissolve ACP 1234 in the water phase. Add water to oils while stirring vigorously. Continue stirring until cream start to set at about 45° C. Add calcium hydroxide and stir to disperse. Part II: dissolve xanthan gum in the water with stirring and heat to 70° C. Cool to 45° C. and add the guanidine carbonate. Part I and Part II have to be combined prior to hair application. Prepare Phase A by dissolving polymer in water. Heat to 80° C. Prepare B by dissolving PVP in water and glycerin. Add B to A with stirring. Mix C with heating to 80° C. When waxes are melted add C to AB. Stir until uniform. Cool to 35° C. Add TiO2 with stirring, followed by preservative and fragrance (SPF 12). Mix A at room temperature, add B with stirring, add C with stirring at 50° C. When clear and uniform, cool with mixing to room temperature. 1. Combine Phase A ingredients, with mixing between additions; heat to 70-75° C.
2. Combine Phase B ingredients and heat to 55° C.
3. Combine Phase C ingredients and heat to 75° C.
4. Add Phase B to Phase A with mixing when Phase A is at 75° C.
5. Add Phase C to the batch with mixing until batch is uniform. Cool to 40° C.
6. Add Phase D at 40° C. with mixing. QS for water loss and mix to RT. 1. Add ACP 1234 to water; mix well. Add Disodium EDTA. Mix well between additions. Pre-mix gum with glycerin and slowly add to Phase A with stirring. Begin heating Phase A to 70-75° C. Add Lubrajel Oil when the gum is well dispersed. 2. Combine Phase B; heat to 75-80° C.
3. When Phase A is stirring at 70-75° C. and Phase B is uniform at 75-80° C., add Phase B to Phase A with homogenization. When batch appears uniform, turn off heat and switch to sweep agitation. 4. Add Phases C and D at 35-40° C.
5. Make up for water loss and sweep to RT. 1. Heat water to 82-85° C.; add remaining Phase A ingredients and mix until uniform. 2. Sprinkle Natrosol into batch using slow homo-mixing. Avoid aeration. 3. Add Phase C color phase (pre-pulverized) to main batch. Mix until uniform using homo-mixing. 4. Heat Phase D to 87° C.
5. Add Phase D to main batch using homo-mixing. Mix until uniform. 6. Switch to sweep-mixing; cool batch to 50° C. Add pre-mixed Phase E, mix until uniform. 7. At 45° C. add Phase F; mix until uniform. 8. Continue sweep-mixing and slow cooling to 30° C. Fill containers. pH=7.40 Viscosity=510,000 cps (Brookfield Model RVT, TE @ 5 rpm). Alterations can be made in the above without departing from the scope of this invention. R and Ro are independently H or a C1-C5 alkyl, provided that at least one of R and R0 is H.
3. The composition of claim 2 wherein said vinyllactam monomer is vinylpyrrolidone. 4. The composition of claim 1 wherein R3, R4, and R5 are independently H or C1-C30 linear or branched alkyl. 5. The composition of claim 1 wherein said anion Z− is selected from the group consisting of halide ions, phosphate ions, methosulfate ion and tosylate ion. 6. The composition of claim 1 wherein said cationic polymer further comprises one or more cationic or nonionic monomers. 7. The composition of claim 1 wherein said cationic polymer contains, by weight, 40 to 95% monomer (a), 0.25 to 50% monomer (b), and 0.1 to 55% monomer (c). 8. The composition of claim 1 wherein said cationic polymer is a terpolymer selected from the group consisting of vinylpyrrolidone/dimethylaminopropylmethacrylamide/dodecyldimethylmethacrylamidopropylammonium tosylate terpolymers, vinylpyrrolidone/dimethylaminopropylmethacrylamide/cocoyldimethylmethacrylamidopropylammonium tosylate terpolymers, vinylpyrrolidone/dimethylaminopropylmethacrylamide/lauryldimethyl-methacrylamidopropylammonium tosylate or chloride terpolymers. 9. The composition of claim 1 wherein said cationic polymer has a weight average molecular weight between 200,000 and 2,000,000. 10. The composition of claim 1 wherein said cationic polymer is present in an amount from about 0.01 to 10 wt % of the total weight of the composition. 11. The composition of claim 10 wherein said cationic terpolymer is present in an amount from 0.1 to 5 wt % of the total weight of the composition. 12. The composition of claim 1 wherein said additive is a conditioning agent. 13. The composition of claim 12 wherein said conditioning agent is selected from the group consisting of synthesis oils, mineral oils, vegetable oils, fluoridated or perfluoridated oils, natural or synthetic waxes, silicones, cationic polymers other than the cationic polymer defined in claim 1, proteins and hydrolyzed proteins, ceramide type compounds, cationic surfactants, fatty amines, fatty acids and derivatives thereof, and mixtures of said conditioning agents. 14. The composition of claim 13 wherein said conditioning agent is a cationic polymer is selected from the group consisting of polymers containing recurring units consisting of primary, secondary, tertiary and/or quaternary amines, quaternary derivatives of cellulose ether, cationic cyclopolymers, cationic polysaccharides, quaternary polymers of vinyl pyrrolidone and vinyl imidazole, and mixtures thereof. 15. The composition of claim 13 wherein said conditioning agent is a silicone selected from the group consisting of polyalkyl siloxanes, polyaryl siloxanes, polyalkyl aryl siloxanes, silicone gums, resins, and organo-modified silicones. 16. The composition of claim 1 wherein said additive is a protecting agent. 17. The composition of claim 16 wherein said protecting agent is selected from the group consisting of hydrosoluble, liposoluble and water-insoluble UV filters, antiradical agents, antioxidants, vitamins and provitamins. 18. The composition of claim 1 wherein said additive is a fixing agent. c) at least one basic monomer, selected from esters with primary, secondary, tertiary, and quaternary amino substituents of acrylic and methacrylic acids and the product of quaternization of dimethylaminoethyl methacrylate with dimethyl or diethyl sulfate. 21. The composition of claim 18 wherein said fixing agent is a nonionic polymer selected from polyalkyloxazolines; vinyl acetate homopolymers; vinyl acetate and acrylic ester copolymers; vinyl acetate and ethylene copolymers; vinyl acetate and maleic ester copolymers; polyethylene and maleic anhydride copolymers; homopolymers of alkyl acrylates; homopolymers of alkyl methacrylates; copolymers of acrylic esters; copolymers of alkyl acrylates and alkyl methacrylates; copolymers of acrylonitrile and a nonionic monomer chosen from among butadiene and alkyl(meth)acrylates; copolymers of alkyl acrylate and urethane; and polyamides. 22. The composition of claim 18 wherein said fixing agent is a functionalized or unfunctionalized silicone or non-silicone polyurethane. 23. The composition of claim 18 wherein said fixing agent is a polymer of the grafted silicone type containing a polysiloxane portion and a portion consisting of a nonsilicone organic chain, with one of the two portions forming the main chain of the polymer, and with the other being grafted onto said main chain. 24. The composition of claim 18 wherein said fixing agent is present in the composition in a relative weight concentration between 0.1 and 10%. 25. The composition of claim 1 wherein said additive is an oxidizing agent. 26. The composition of claim 25 wherein said oxidizing agent is selected from the group consisting of hydrogen peroxide, urea peroxide, alkali metal bromates or ferricyanides, persalts, and redox enzymes, optionally with their respective donor or cofactor. 27. The composition of claim 26 wherein said oxidizing agent is hydrogen peroxide. 28. The composition of claim 27 characterized in that said composition is a solution of oxygenated water whose titer varies from 1 to 40 volumes. 29. The composition of claim 28 characterized in that said composition has a pH greater than 7. 30. The composition of claim 1 wherein said additive is a reducing agent. 31. The composition of claim 30 wherein said reducing agent is selected from the group consisting of thiols, thioglycolic acid, thiolactic acid and cysteamine. 32. The composition of claim 1 wherein said additive is a dye. 33. The composition of claim 32 wherein said dye is selected from the group consisting of neutral acid or cationic nitrobenzene dyes; neutral acid or cationic azo dyes; quinone dyes; neutral, acid or cationic anthraquinone dyes; azine dyes; triarylmethane dyes; indoamine dyes and natural dyes. 34. The composition of claim 32 wherein said dye is present in an amount from 0.001 to 20 wt % of the total weight of the composition. 35. The composition of claim 1 further comprising at least one amphoteric polymer or cationic polymer different from the cationic poly(vinyllactam) defined in claim 1. 38. The composition of claim 35 wherein said amphoteric polymer is a copolymer containing at least one acrylic acid and a dimethyldiallyammonium salt as a monomer. 39. The composition of claim 35 wherein said cationic or amphoteric polymer or polymers are present in an amount of 0.01 to 10 wt % of the total weight of the composition. 40. The composition of claim 1 further comprising at least one surfactant chosen from anionic, cationic, nonionic or amphoteric surfactants. 41. The composition of claim 40 wherein said surfactant is present in an amount of 0.01 to 40 wt % of the total weight of the composition. 42. The composition of claim 1 characterized in that said composition has a pH from 2 to 12. 43. The composition of claim 1 wherein said cosmetically acceptable medium is formed from water or one or more cosmetically acceptable solvents. 44. The composition of claim 1 further comprising at least one additive selected from the group consisting of cleansing agents, anionic, cationic, nonionic, or amphoteric surfactants, perfumes, stabilizers, pH adjusters, preservatives, colorants, bleaching agents, highlighting agents sequestrants and any other additive conventionally used in cosmetic compositions. 45. The composition of claim 1 further comprising at least one alkalizing or acidifying agent in an amount from 0.01 to 30 wt % of the total weight of the composition. in which R is a propylene residue optionally substituted with an hydroxyl group or a C1-C4 alkyl radical; R38, R39, R40 and R41, identical or different, represent a hydrogen atom, a C1-C4 alkyl radical or a C1-C4 hydroxyalkyl radical. 47. The composition of claim 45 wherein said acidifying agent is selected from mineral or organic acids, carboxylic and sulfonic acids. 48. The composition of claim 1 wherein said composition is anhydrous and intended for bleaching or permanent wave waving of human keratin fibers. 49. The composition of claim 1 which is a skin altering composition and which further contains a cosmetic removal agent, a skin stimulating agent, a depilatory agent, an astringent, a skin abrading agent, a wrinkle mollifying agent, a moisturizing agent, a sun blocking agent, a skin soothing or healing balm and mixtures thereof. ES2288216T3 (en) 2008-01-01 Cosmetic agent containing at least one water-soluble copolymer with units amides of (meth) acrylic acid. ES2279230T3 (en) 2007-08-16 ampholytic copolymer and its use.